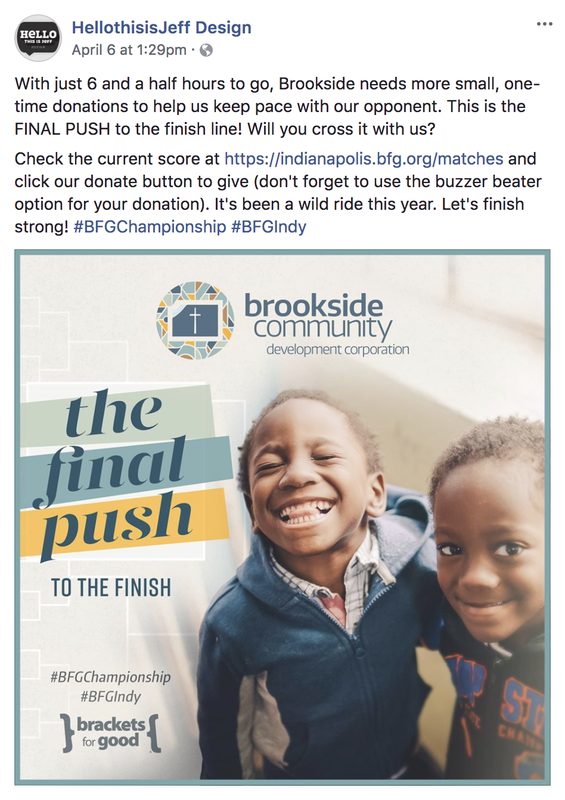 A few weeks ago, I wrote a blog post about how one of my clients, and the non-profit arm of my home church – Brookside Community Development Corporation – was the last charity to be invited into our city's 2018 Brackets For Good tournament. After four exciting rounds where we just barely nudged out the competition, we found ourselves against all odds in the Philanthropic 4. As one of four final contenders, we were gearing up to make an improbable run at the championship and the $10,000 grand prize! If you've been following me on Facebook, last week you saw several posts with updates on Brookside's progress through the final rounds. I've included screenshots of the posts below to help tell the story of how Brookside CDC faired as the tournament came to a thrilling close. Our "Philanthropic 4" matchup against Agape Therapeutic Riding was not going to be easy. They had already raised a mind-blowing $62k in the rounds leading up to our face-off. By comparison, Brookside CDC had raised a modest (but surprising to us) $27k before entering the same round. Our chances looked awfully grim. On Tuesday night of last week, things got pretty intense in the final few minutes of the round, but amazingly, Brookside came out on top! It was on to the finals and into a matchup with the formidable underdog killer, NeuroHope. Previous to the championship round, NeuroHope had eliminated a string of smaller competitors by wide margins. Then they took it to the next level by besting the top organization in the entire tournament, Hamilton County Humane Society, who had raised over $31k in a single round! It was time for us to make our own championship-worthy appeal. From the start, NeuroHope's supporters were all in, dropping $5, $10, and $25 donations seemingly around the clock. With a few hours to go on Friday, April 6, Brookside received a sizable donation that caught us up and put us on top. As my wife and I arrived at the final watch party with just under an hour to go, Brookside was up nearly $5,000 on the scoreboard. As the minutes wound down, Brookside's supporters started cranking it up with large gifts, but NeuroHope seemed to match us gift for gift, plus they still had the steady stream of smaller donations coming in. They were gaining ground. In the final minute, the floodgates just broke wide open on both sides. A $7,500 and a $5,000 gift hit for NeuroHope within seconds of each other. Then with just about 15 seconds on the clock, a $10,000 donation came through for Brookside. The room turned into pandemonium, as we cheered what we thought was sure victory. As time ran out, Brookside sat on an $8-9,000 lead! But it wasn't over. In Brackets For Good, you can split your donation and post half right away and save half to be revealed only at the final buzzer. In the previous rounds, Brookside had relied on a large percentage of buzzer beater points to propel us to the win. However, as the live feed refreshed and updated to the final totals, we saw we had been out-maneuvered at our own game. Nearly all of NeuroHope's points scored in the round had buzzer beaters attached to them. For Brookside, that number was smaller than expected. Final score: Neurohope $42,339, Brookside CDC $40,207. Even though we didn't win it all, we still came out with a huge win because we were able to keep all the donations we raised throughout the tournament, resulting in a grand total of $85,897! Thanks anyone who followed along with us through this 5-week Cinderella run, and a special shout-out to those who gave to our cause or helped spread the word by sharing a Facebook post or telling a friend. We could not have advanced as far as we did without the unbridled generosity of our awesome supporters and the good grace of our God with us all the way! If you're interested in learning more about what Brookside CDC is all about, visit brooksidecdc.org and follow their Facebook page.